Arcade machines—shopping mall and variety store staples in the 1980s and 1990s—are now a rare breed, supplanted by the portability and comfort of home consoles, computers, and, more recently, smartphones. It’s a shame; for anyone who saw an arcade as a second home there was joy in the darkness pierced by colourful screens, the cacophony of bleeps and bloops, and the presence of a large, bearded man in the corner saddled with a generous apron filled with quarters. Following the adage that “everything old becomes new again,” a group of Toronto game makers called The Hand Eye Society is part of a global movement to revive the arcade machine and make it relevant once more. (Full disclosure: The Hand Eye Society and its members have volunteered for and spoken at Gamercamp, the games festival I co-organize.) This weekend will see Hand Eye unveiling its newest arcade machine, called the Torontron High Roller, at the Toronto Comic Arts Festival. 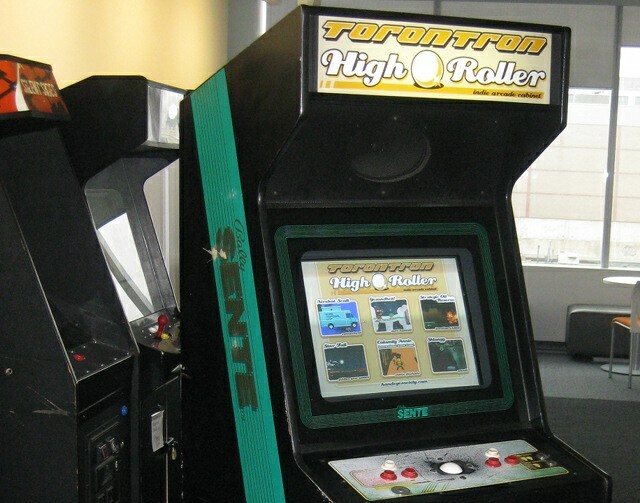 The Torontron High Roller is so named for its trackball, a cabinet feature often used to play electronic versions of bowling and pool games; it’s included on the machine to better suit games that used a mouse as part of their controls. “Most indie games are developed for the PC, so this is a huge untapped area,” noted local game maker and Hand Eye member Miguel Sternberg in an email exchange. “I think the High Roller may be the first indie arcade cabinet that can support these types of games properly.” As the curator for the Torontron High Roller, Sternberg chose six games from different genres that made inventive and varying use of the trackball, such as puzzlers, racers, and shooters. The High Roller games are from Toronto artists, except an international guest spot filled by noted American indie developer Auntie Pixelante. The main screen for the Torontron High Roller arcade cabinet. The Torontron machines attempt to increase exposure and expand the audience for independent games. Often, independent games are released on PC and result in solitary play experiences—the stroke of genius within the Torontrons is bringing the action out of players’ homes and into the open, where a cabinet can allow for social experiences. Sternberg concurs: “As games have moved away from arcades and onto online services and Facebook, they’ve become less social. There’s something special about a place you can meet up with strangers to play, compete, and co-operate with. Sure you can kind of do all that online; however, so much nuance and communication between players is lost over things like voice chat and the like.” The loss of contact rings true for anyone who haunted an arcade and knows there is no substitute for lining up quarters on a busy machine as a queue to play, while striking up conversations about games with other waiting enthusiasts. Toronto’s independent games community isn’t alone in trying to recapture the feel of the arcade. The Torontron itself has been a large influence, creating a chain reaction inspiring a Winnitron in Winnipeg, which in turn has been picked up as far away as New Zealand. Concurrent to the Torontron, similar machines were built in New York City in a project spearheaded by Babycastles, a local artistic collective working to further game culture, and drew the attention of media such as the New York Times. Arcade cabinet projects are also slated for Seattle and Austin. The revival of cabinets for independent games won’t bring arcades back to their former prominence, nor is that the intent. Still, there’s an excitement to knowing that once more there’s an opportunity to grab a friend, stand shoulder-to-shoulder, and together journey into the imaginary world of a game. With a good game, time spent in enjoyment isn’t measured in minutes, but in quarters. Photos courtesy of The Hand Eye Society.